I didn't have a clue what to make for my middle daughter's Christmas gift. 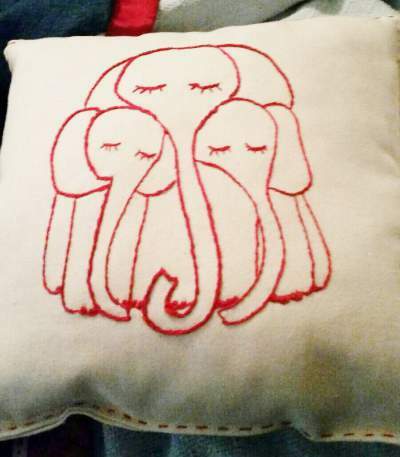 When I came across a photo on Pinterest of pillows embroidered with elephants in a whimsical way, I knew I found what to make my sweet girl. She collects elephant statues, ceramics, knick knacks, small paintings, you name it. She even has a little tattoo, but, no pillows! So pillows it was. I used an off white canvas fabric and kept the stitching in red since that's her favorite color. Then stitched around the edge of the pillows in red also. What a fun project to practice backstitch. They are adorable! You're embroidery is beautiful! I love elephant's, too. 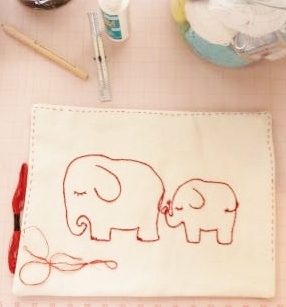 I'm working on an elephant cross-stitch bib and my next crochet project is an elephant lovey. Wow I am impressed and jealous. I wish I could do that, but you have to sew to do that. They came out beautiful! . Great idea. Thank you all for the kind comments. I got a text just a bit ago from my daughter telling me, "I'm looking at my pillows right now- So cute!. Now I have something to cheer me up when I get off work". She's an ICU RN and sees some awful things. I'm so glad I chose this gift for her. Those are wonderful! So cute!